A ladyman that's a little more convincing than ours. Stevenage has a cross-dresser – not an easy place to be one, I would imagine. We probably have more than one but I can only comment on the very short, oriental chap that makes for a very unconvincing woman. Invariably he’s in high heels which he has enormous trouble walking in. He looks even more ungainly when he tries to run in them – which I witnessed last week. He wore a long coat over an evening dress and high heels with diamante tassles. Careering along the bridge from the station to the car park, he looked like he was going to turn his ankle with every step. He’s thinning on top and has a very masculine face, so he is to be applauded for his bravery in putting his preferences on public display when he’s fooling absolutely no one. It had to happen one day and today was that day. Apologies for the composition; I was running for a train that I missed by 4 minutes. Three silver Focuses (Focii? – no that sounds like an Italian bun) in a row. 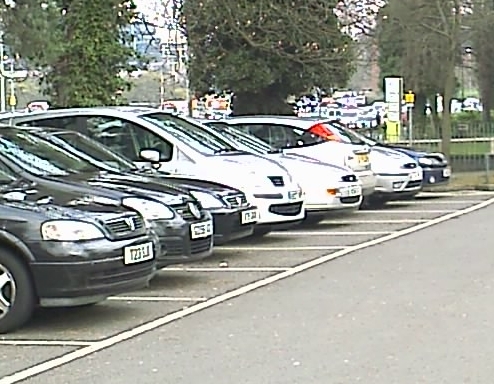 Study the picture carefully, starting with the second furthest car – mine in fact. I chose a silver Focus as it’s reliable and it’s the most common car in the most common colour – and as such, invisible in the Stevenage urban landscape. That didn’t stop it getting keyed one sunny day last summer. Numerous attempts with T-Cut and Ford colour pens have done nothing to help. However, I did find that the winter coating of dirt did hide a multitude of sins (except how dirty my car was). I have only ever parked in the Westgate multi-storey once. No joy at Swingate, none at Danesgate either. I bypassed Southgate (a lot of ‘gates’ aren’t there) and ended up being one of 5 cars in a car park with a capacity for 1023. A long walk to and from the station too – but in bad weather, it could be your friend. But like I say, I’ve only needed it once. Not the most inviting place but I would say that this chap has taken his reaction to extremes. You’ll be pleased to know that it all ended happily. After an hour and a half of negotiations, he was persuaded to climb down and stop being so silly. I have no information beyond that, but if this was you, here’s another YouTube gem to cheer you up and stop it from happening again. A stony silence. Growing up can generate friction between siblings. Finally my cameraphone spits out a half-decent image. Not much to report. Both Hansel and Gretel are still in Trolley Corner. I also spied a similar trolley outside the Gents in Stevenage station, which would mean it had been wheeled through the ticket barriers. I would have taken a piccy but my train was pulling in to the station. There are many good causes for which one could miss one’s train. Taking a photo of a shopping trolley outside a toilet is not one of them. 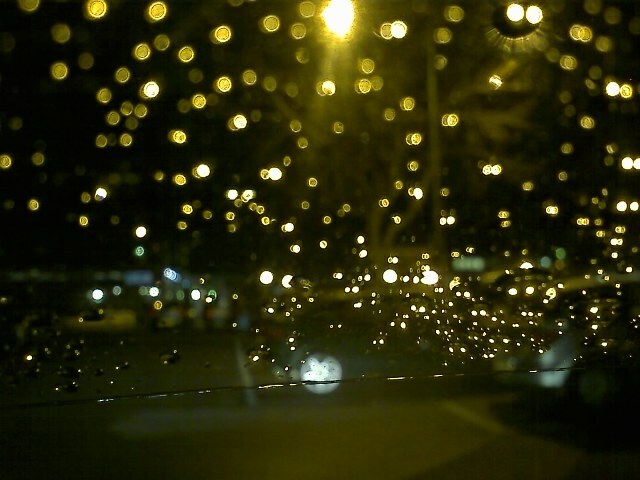 So in the meantime, here’s a photo of my car’s windscreen where the wipers don’t reach. Same corner. New trolleys. Somebody call Scooby and the team. No doubt at the time, leaving a trail of pound coins so they could find their way back home to Tesco seemed like a very good idea. Unfortunately, unattended pound coins don’t hang around for long in Stevenage – especially when Poundland’s within walking distance. A pound will get you a 12-pack of pan-scourers or an extremely fragile toy truck; that kind of temptation is hard to resist. These two turned up a couple of days ago. I tried to take a photo the night before last but the flash on my cameraphone is bobbins. At first I thought one had come along to keep the original orphan company, but no. These two are brand new to Swingate’s nascent Trolley Corner. They’re both from Tesco. Careful examination of previous TrolleyWatch posts will show that the original ‘top-up-shop’ trolley (as apposed to the ‘big-weekly-shop’ version) was in fact from Asda. 1. They get the train. They push the trolley yea far and save themselves 300 yards of bag-carrying. If they’re getting on the train, it’s all steps from here on in, so there’s nothing for it but to abandon trolley. 2. The more I think about it, the more I think I only have one theory. Could YOU foster an abandoned trolley? Is there a sadder sight? At least before, this young trolley had company, some protection. But no more. Perhaps unsurprisingly, the Tesco trolley has been retrieved first because the store’s only 300 yards away – well within the search radius of their trolley patrol. Perhaps they’ve alerted the proper authorities about the remaining trolley. We can only hope. Note the protective maternal stance of the Tesco trolley. This has become an impromptu theme. 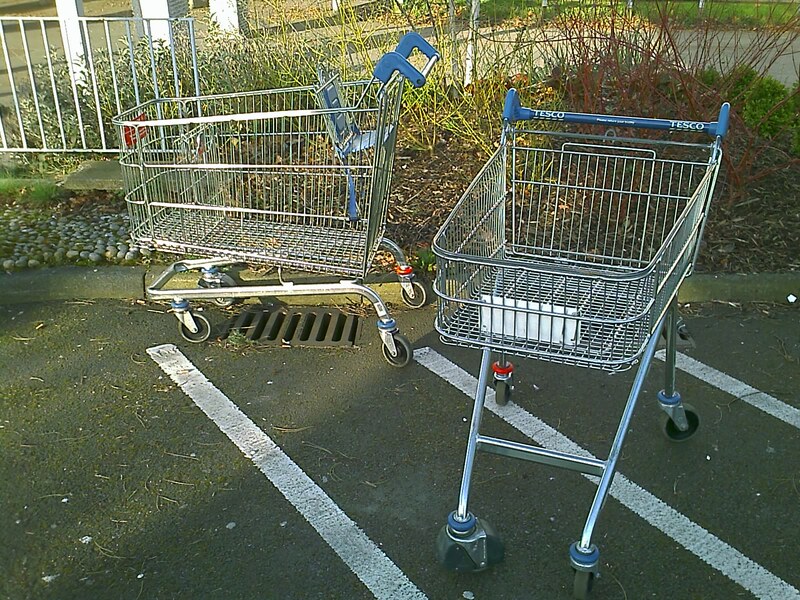 I never meant to develop a sub-blog based on shopping trolleys in Stevenage. The subjects came to me, not the other way around. However, I may eventually get civic recognition for my public-spirited attempt to reunite the trolleys with their rightful owners. Or perhaps not. At last. The rains. They have come. Finally it rained, giving me the chance to see how this Rain Clear stuff works. And I’ve got to say, I’m impressed! Even driving into a moderate headwind, any rain just beads and makes a beeline for the edge of the windscreen long before the wipers come to usher them out of the way. If anyone’s interested, you can get it here. Wheelie suitcases: another reason to hate. Particularly large wheelie cases can cause problems going through ticket barriers. Unwary travellers with these unwieldy wheelies will be unaware that the barriers are likely count them as two people, not one person with an annoying suitcase. Barriers: incompatible with idiots with large wheelies. Alas the luggage has no ticket for itself, so the barriers come crashing in on it, jamming up that lane and forcing the unfortunates behind (e.g. me on Friday evening) to force their way into an adjacent queue. Meanwhile, the London Underground guy, responding to the suitcase and barrier’s distress, is himself blocking up the adjacent barrier. Were this to continue, global gridlock would occur, meaning that no one anywhere could move. At all. I imagine.